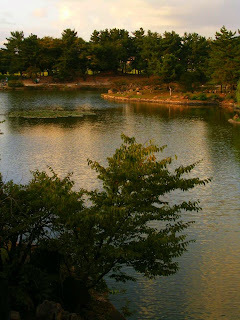 My first trip outside Japan, since I started living in Nagoya, was to South Korea. Although there are flights from Nagoya, the cheapest option I found was to travel from Osaka airport to Seoul Incheon. 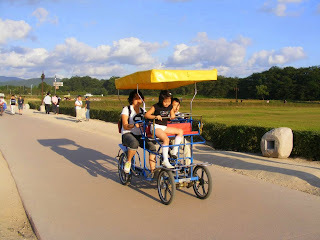 I received lots of suggestions from my Korean friends who were always happy to hear I was going to visit their country. I bought a Korean Rail Pass in order to use the fast KTX trains as much as I wanted during 3 days. 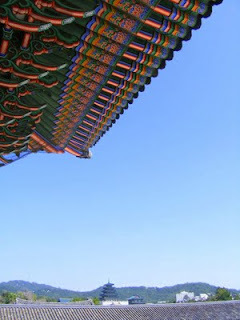 Seoul, the big capital, is the heart of the Korean peninsula. I visited several districts and the general feeling after coming back was that I still had much to discover in this great city. 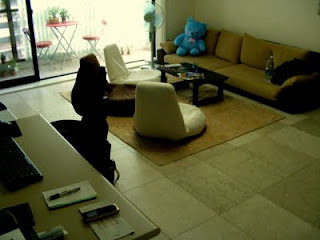 I stayed in a hostel called Namu guesthouse, which was really nice. 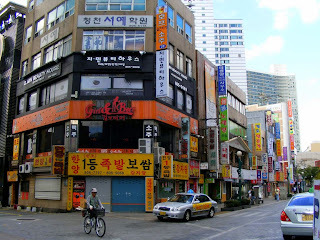 It was located near the Hongik University district, full of youngsters, restaurants and entertainment places. One of the things I enjoyed the most in Seoul was its theaters. 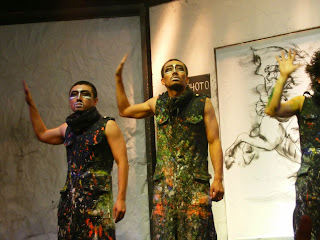 I went to see two great performances: "The drawing show" and "JUMP". The former was a very funny show were several artists were drawing in life and with different techniques to the amusement of the attendants. Although it was not allowed to take photographs or record video during the show, I found this video on youtube. The latter was one of the most amazing shows I have seen in my whole life!! It mixed comedy with martial arts and it was really funny. I also found some videos on youtube! There are more performances that I couldn't see due to time restrictions like for example the Nanta show. 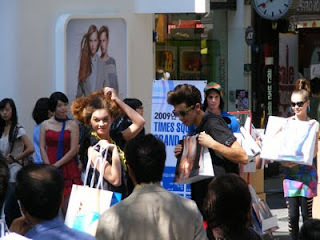 The district of Myeong-dong was full of fancy shops and other trendy business. It reminded me of Shibuya district in Tokyo. I walked by and I arrived to the city hall where there is a big square good to make concerts and similar events. 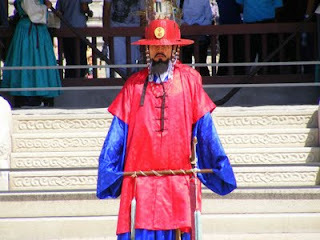 I wanted to visit some historical place in Seoul as well and I decided to visit the Gyeongbokgung palace. It was worth the visit and I could take pictures with a nice light thanks to the good weather. 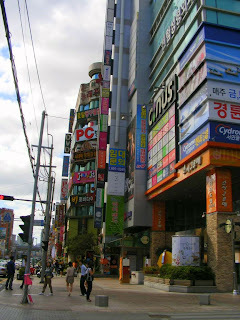 I also visited the nearby district of Insadong. 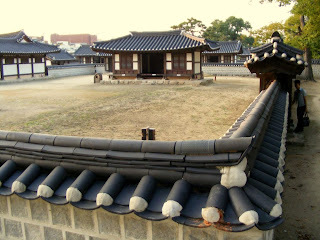 Jeonju looked quite poor compared to Seoul. 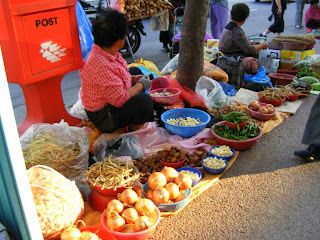 There was a huge open market where peasants where selling their products. Although I think they didn't have the necessary higienic conditions! 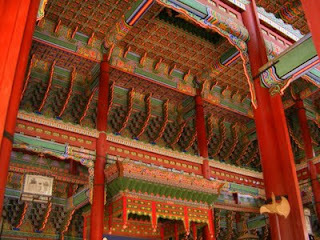 I walked all over the city and saw Jeonju streets (Film street, youth street, chinatown..) but I had not prepared the visit enough so probably i missed a lot of interesting things. 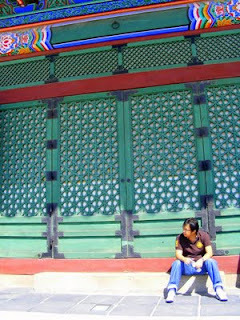 The most cultural asset I visited was Gyeonggijeon. 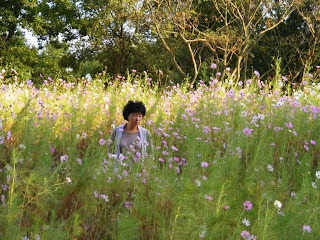 In the above three pictures I am showing some details about Korea environment that surprised me. 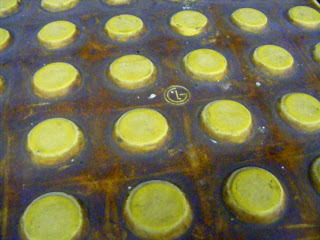 First, the LG brand on the yellow lines for blind people. 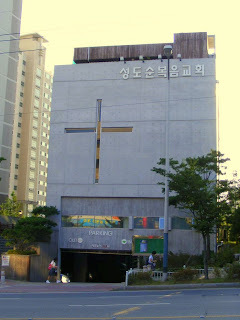 Second, the deep penetration of the Christian church in Korea (although I already had noticed about it in Nagoya during Easter). 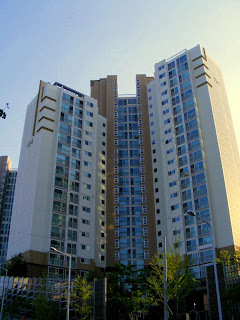 And finally, the huge blocks of flats that are all over Korea. 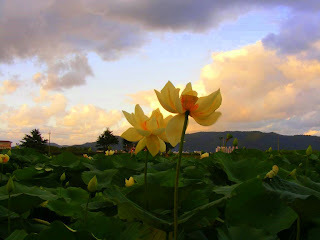 Specially surprising if you compare them with the urban landscape of Japan which consists mainly of small houses. 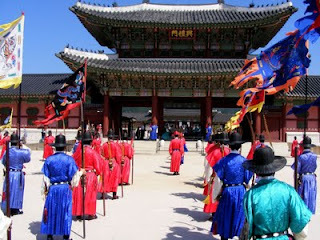 Gyeongju is a city in the southeast of the Korean peninsula with lots of interesting cultural heritage. Unfortunately I didn't have time to see everything and had to leave some places for another visit. 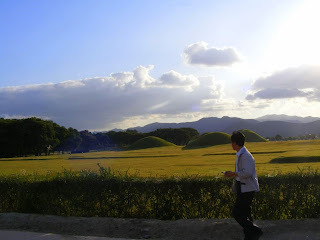 I started seeing the Daereungwon royal tombs, which were like small mountains in the field. Then there was a nice walk near a famous astronomical observatory from the past. 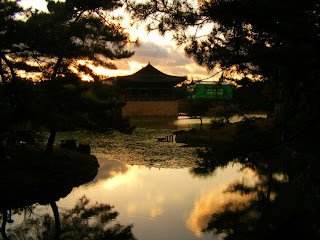 Imhaejeon site had a very nice pond called Anapji and some traditional temples. 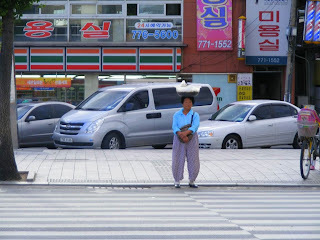 A Korean old woman carrying food on his head. 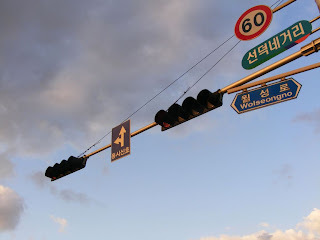 One thing I noticed in Korea was that the traffic lights had 4 lights! I guess the forth one was for turning right or something like that. 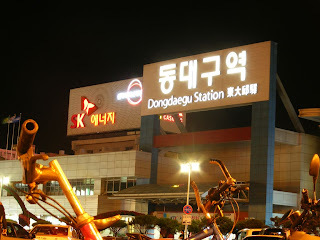 After visiting Gyeongju I passed by Dongdaegu station in order to take the KTX train to Busan, where i would spend the nigth. 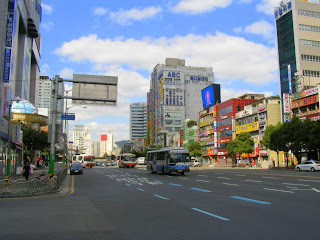 I had a feeling that Daegu would have been a good city to visit though. 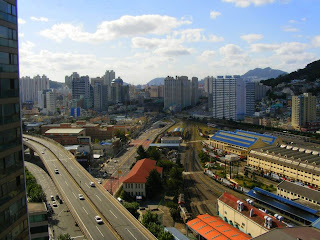 I didn't see much about Busan and definitely I will have to come back once again. The hostel where I stayed (Zen backpackers) had great views. 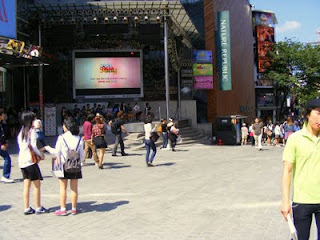 It was near the center of the city which is the only place I saw in Busan. 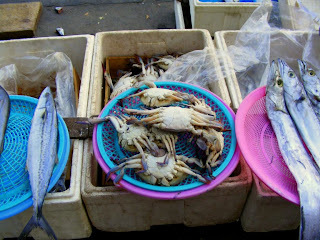 Full of restaurants and very lively! 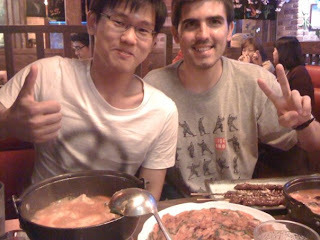 It was a Saturday night and I was walking alone among the crowds of Koreans having fun and eating tasty food with their friends. 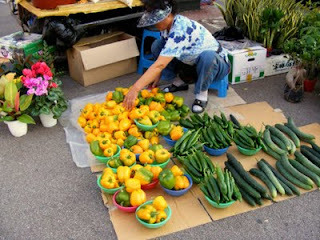 Food is one of the best things about Korea. Most of Korean restaurants expected you to go to eat with a friend so sometimes I preferred to buy something in the supermarket to eat alone. 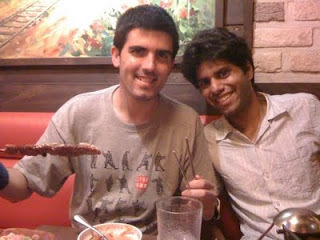 Fortunately, I made some friends in the hostel and went for dinner with them. Everything was delicious despite being so spicy! 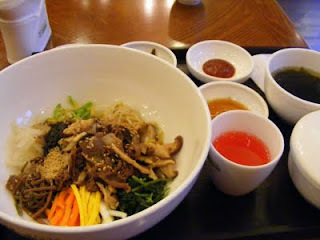 My favourite dish was the Bibimbap. A bowl with vegetables very typical from Korea. busan, em? pues es un puerto de contenedores muy tocado, hay muchos servicios regulares a ese puerto, has estado alli? Ya sé que me tripito pero tío, que guapamente te lo debes estar pasndo, tanto que has visto y más que verás, tantas experiencias, es envidiable, de veras que sí. Yo no soy mu "viajador", es este otro factor que te envidio sanamente. Eso de irte por ahí a ver mundo, sólo o acompañado, con tu cámara, tus notas, tu armónica... Es genial compañero... Cuando te "vayas" de este mundo lo harás bien llenito jeje. I recognise some of these places ;) especially the hostels :) .. i think so far those two have been the best hostels i've stayed in asia..